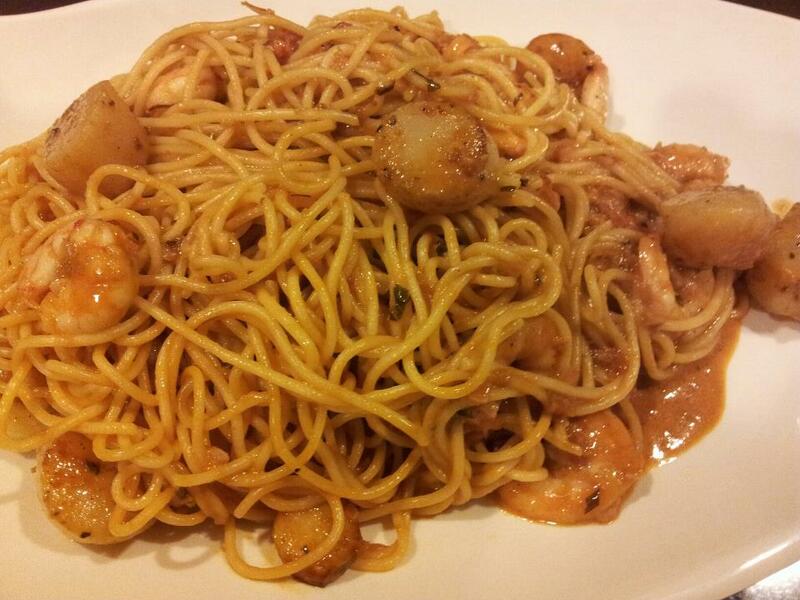 One of my favourite pasta is the crab meat linguine in pink sauce. Many moons ago, when Chef Valentino was still working (I guess he was a partner) in Cantina which was a short stone-throw from my place, we dined there a few times and also “da bao” (take-out) his crab meat linguine in pink sauce. The good Chef left & set up his own Ristorante da Valentino at Jalan Binga and later shifted to the much larger premises it is currently located at Turf City. Some months back, a friend & his wife invited me for a lunch there, and I enjoyed immensely the burrata cheese and also relished my old-time favourite – but this time a squid-ink seafood linguine in pink sauce. To make the sauce, I saute minced garlic and 1 small onion (diced) in olive oil on medium heat. I then add chopped basil (I have fresh basil from the garden), 1 can of diced tomatoes with sauce, sugar, dried oregano, sea salt & coarse black pepper, boil for about 5 minutes. I then turn off the fire and mix in the heavy cream & butter. The spaghetti is cooked in the usual way following the timing instructions. For the scallops (optional), I pan sear them first (see recipe); and likewise for the prawns I stir-fry them in olive oil first to almost cooked. All these can be set aside first and toss together when ready to serve the dish. I heat up the pink sauce, add the prawns & drained crabmeat, cook for few minutes, then turn off the fire, add the spaghetti & toss, and then add the seared scallop, and serve. 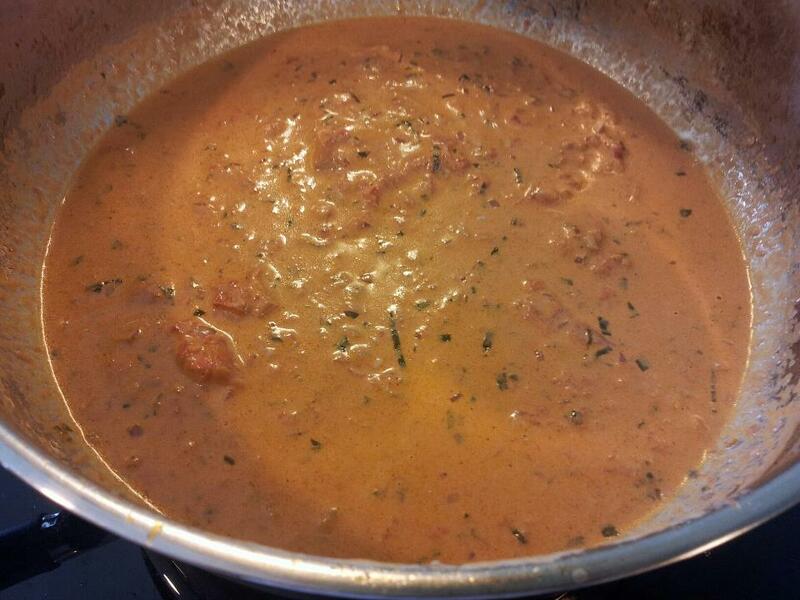 Prepare the pink sauce – saute minced garlic and diced onion in olive oil on medium heat. add chopped fresh basil, 1 can of diced tomatoes with sauce, sugar, dried oregano, sea salt & coarse black pepper, boil for about 5 minutes. turn off the fire and mix in the heavy cream & butter. Prepare the scallops (optional) – see pan-seared scallop recipe. Cook the dish – stir-fry the prawns (shelled) in olive oil first to almost cooked. cook the spaghetti in the usual way following the timing instructions. heat up the pink sauce, add the prawns & drained crabmeat, cook for few minutes, then turn off the fire, add the spaghetti & toss, and then add the seared scallop, and serve. This entry was posted in Recipes and tagged cold pasta, crabmeat, creamy tomatoes, linguine, mud crab, pink sauce, scallops. Bookmark the permalink.